LetoMotel München City Ost i München, Tyskland: Reservér nu! LetoMotel München City Ost is located in the eastern part of Munich (Trudering - district of Munich) and offer 135 comfortable rooms. The Motel offers a 24-hour reception, luggage storage, Snack- and Beverage-machine. Free public parking, private parking and underground parking spaces (for 10,00 € per night) are available. LetoMotel München City Nord has been welcoming guests since 15 April 2015. 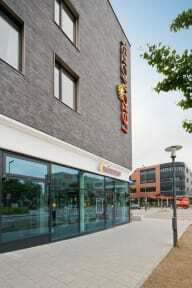 Guests can enjoy a varied breakfast in the bakery, which is a 1-minute walk from LetoMotel München City Ost. There are various restaurants, bars and shopping within walking distance. There are direct train connection to ICM International Congress Center, Munich Central Station and the Marienplatz. The rooms at the LetoMotel München City Ost are all soundproof as well as allergy friendly. Additionally, the rooms also come with air-conditioning, privat bathroom, an electric kettle, tea/coffee facilities and a satellite flat-screen TV. All children are welcome. We offer also free of charge Baby beds. Pets are not allowed. All children are welcome. We offer also free of charge Baby beds.